Kayaking without a guide in Kyuquot is recommended only for experienced west coast paddlers. As an independent paddler in this setting, you need strong kayaking skills, great incident prevention judgment and management abilities, and competence with navigation, weather interpretation, and radio communications. If that's you, then we're happy to rent you one of our kayaks for your own trip in the area. Otherwise, please seriously consider a guided trip (with any respected operator) unless travelling with an experienced leader who is taking responsibility for trip safety - please don't simply rent or borrow a kayak from someone else. This is common sense safety advice for the west coast, not a business pitch. you don't have the hassle and cost of transporting a kayak to and from this remote area, and can instead conveniently arrive by float plane or car pool without worrying about a pyramid of kayaks on your roof! if you're coming from or continuing to other vacation activities on northern Vancouver Island, you don't have to worry about the safety and security of having a kayak on your car roof (and the stinky wet gear inside). Our kayak fleet is primarily used for our scheduled tours, so often limited availability for rentals. As such, we usually cannot confirm kayak rental availability until after June 1st. Whenever possible, we will confirm earlier depending on what we know about tour booking details and guest needs. We recommend that you contact us early to inquire, and we'll confirm availability as soon as possible. When making your reservation, we will need confirmation that you are an experienced kayaker with basic training in wet exits, capsize recovery methods (self and assisted rescues), strokes, navigation, and safety communications. If you are new to kayaking, we will otherwise need assurance that you will always be paddling with someone more experienced on the west coast and who is clearly taking responsibility for your on-water safety as the "leader". The Kyuquot area is spectacular, but also remote with rugged shorelines and often challenging weather and sea conditions that can change rapidly. To rent from us, you must read and sign a release of liability form for kayak rentals and provide your credit card number in case of any significant damage or loss of the kayak and associated gear while in your care. All prices are from our base camp on Spring Island. Additional fees apply if we are dropping off or picking up kayaks in the Village of Kyuquot, Fair Harbour, or elsewhere. Alternatively, local water taxi operators will charge an additional fee for their time to pick up or drop off kayaks on Spring Island. 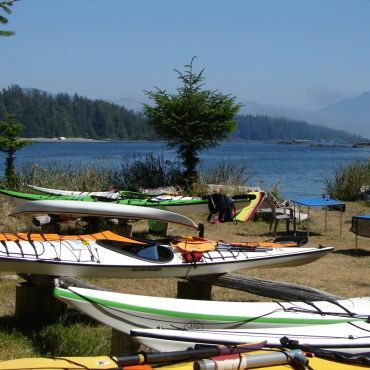 Note: Prices include rental from our Spring Island base camp, paddle(s), spray skirts, pumps, throw ropes, paddle floats and of course PFD's - meeting all Coast Guard Small Vessel Safety requirements. Prices do not include the applicable taxes (5% GST & 7% PST) or any additional expenses associated with special arrangements for delivery to/from Kyuquot or Fair Harbour. Cancellation Policy: We require full payment to secure a kayak rental, and a minimum 4 week notice of cancellation for a refund, less a 10% administrative fee. For any cancellations within 4 weeks of the reservation date, a 25% administrative fee (min $50) will be retained...unless that cancellation is within 7 days, in which case no refund is provided unless we've incurred nothing but administrative costs in association with the rental reservation. Please contact us by phone or email with questions or to arrange your reservation.